The boys had a guest today, their good friend Katt. They all headed up to Habanero Mexican Cafe. This is a pretty small place and they were quickly seated. No sweet tea here to Rusty's dismay. The chips weren't bad and were served warm which is always nice. The salsa was the cooked variety with a nice smoky flavor. It had a nice heat to it that was a bit much for Katt. The order arrived very quickly and the hungry trio got to work. Steve ordered the regular enchiladas with beef, which came with a red sauce and cheddar cheese. There wasn't much sauce on these which is a shame is it seemed pretty rich and savory, though there wasn't even enough to get a proper taste of the sauce alone. The beef filling wasn't heavily spiced but was tasty. The cheese was very good, too. The enchiladas here come with some pico de gallo and lettuce which is a nice touch. Rusty had the verde enchiladas with chicken, which came with a tomatillo sauce and white cheese. 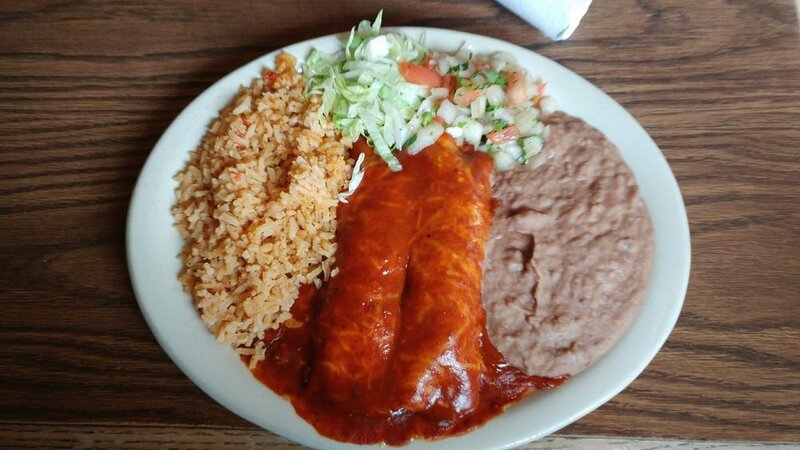 Katt went with the supremas enchiladas - chicken with a red sauce and white cheese. Katt and Rusty noticed the chicken in both of their enchiladas was the same, red in color and a bit dry. Rusty thought the flavor of the red spiced chicken conflicted with the verde sauce, which he really liked. Katt wasn't particularly impressed with her enchiladas. The beans were very good with a rich, savory flavor and nice texture, while the rice was a bit mushy.